The GMAT Integrated Reasoning section is devised to measure the ability to evaluate information presented in multiple formats from multiple sources – skills needed to succeed in the current technologically advanced, data-driven world. The GMAT Integrated Reasoning Section includes 12 Questions with an allotted time of 30 minutes with the following: Multi-Source Reasoning, Graphics Interpretation, Two-Part Analysis, Table Analysis . This new segment of the GMAT was presented in June 2012. It has 12 questions with thirty minutes to answer this segment. This segment has replaced one of the AWA essays. The score is on a scale of 1 to 8. This segment tests how well you can make utilization of your analytical skills to solve a complicated issue. You are given with information in different forms. Table Analysis: In this, you are provided with heaps of data in a table format. The question asked expects you to pick answers from yes/no, true/false with various explanations to answer under each question. Graphics Interpretation: In this type, you are given a diagram or a graphical picture. You’re relied upon to translate the graph and finish the statements given by picking one of the options from the pull-down menu. Multi-Source Reasoning: Here you need to accumulate data by clicking on the different tabs (2-3) provided. The information available may be displayed either as text or in the content of charts, tables. The answers might be in the yes/no, true/false format or as multiple choice options. Two-Part Analysis: You have a question and various choices provided. The answers in a table form have the two segments occupying the first two columns and the answer options in the third column. Of all the options provided, you need to pick just one choice under each component to complete one answer. The table above gives sale information for the 20 bathroom cleaners in the United States in 2010. For each product, the table describes the brand of the product, the product type, fragrance, unit sales, percent change in unit sales since 2009, total dollar sales, percent change in dollar sales since 2009, average price of each unit sold, and the dollar change in price since 2009. Each column of the table can be sorted in ascending order by clicking on the word “Select” above the table and choosing, from the drop-down menu, the heading of the column on which you want the table to be sorted. Consider each of the following statements about these sales figures. For each statement, indicated whether the statement is true or false, based on the information provided in the table. a. The product with the highest unit sales in 2010 also had the highest dollar increase in price since 2009. Explanation: Super Clean’s Fresh Spray had the highest unit sales, but Deluxe’s Orange Spray had the highest dollar price increase. On a problem such as this, in which the question asks whether the leader in one category is also the leader in another, it is best to start by sorting by one of the categories. Then, either scan the other column for a higher value, or sort by the second category to see whether the same item stays at the top of the list (when doing that, however, be careful for a “tie”). b. Every orange scented product experienced growth in unit sales from 2009 to 2010. Explanation: Of the six Orange sprays, all experienced unit sales increases. One can best solve for this by sorting by the Fragrance category to align all the Orange items together, then by scanning those together along the “% change” column to see whether any of those products experienced negative or neutral unit sales. c. No product experienced growth in dollar sales but a decline in unit sales from 2009 to 2010. Explanation: Four fragrances experienced dollar sales growth but also a decline in unit sales. In a case like this, when the statement says “no fragrance…” you need only find one exception to that universal statement to consider the statement false. d. The highest-priced product in 2010 was also the highest-priced product in 2009. Explanation: Super Clean’s Fresh Aerosol is the highest-priced item at $4.33, and this price reflects a $0.05 decrease from 2009, signifying that it was the highest-priced item in 2009 as well. Note here that the “current price” column reflects the 2010 price, and that the $ change column shows the difference from 2009. Accordingly, to determine 2009 price, one needs to add the decreases to the 2010 prices or subtract the increases to the 2010 prices; this counter intuitive logic is likely to confuse examine es, making this a tricky question. a. Spray bathroom cleaners generated more dollar sales than any other single type of bathroom cleaner in 2010. Explanation: With this question, the author is hoping to draw you into a time pit of calculations but will reward you for efficient logic if you see that the calculations are unnecessary. On a true/false question like this, it’s typically best to take the statement and hold it up to scrutiny; in this example, the statement is that “Spray cleaners generated more dollar sales than any other single type of bathroom cleaner”. Your burden of proof, then, is to find one type that could have outsold spray cleaners – you only need to consider the cleaner types that are even “contenders”. Accordingly, Powder cleaners are irrelevant – there are only two such cleaners and the leading cleaner doesn’t have enough separation from the field to make it a runaway category. The decision to be made is between Spray and Aerosol, and so your mission is to determine which sold more. You can effectively do this by viewing it as a “horse race” and not a calculation. Spray starts with two higher-sellers than Aerosol, earning approximately $33M and $27M to Aerosol’s two biggest totals, $22M and $21M. This gives Spray a $17M “gap” that Aerosol needs to make up, and with the next highest seller also a Spray Cleaner, the gap widens to nearly $18M. From there, you can simply compare one-to-one the remaining Spray and Aerosol cleaners on the Dollar Sales list to see whether the gap will come down to something competitive. It does not – notice that further down the list the dollar figures become so small that they’ll make little if any dent in that gap between Spray totals and Aerosol totals. Rather than calculate, you can logically call this one a runaway just by judging the gaps at the top of the list and noting the limited opportunities for Aerosol to close it down. b. Half of the bathroom cleaners that experienced a drop in average price from 2009 to 2010 were aerosol cleaners. Explanation: Of the six cleaners to experience a decrease in average price, only two were aerosol cleaners. To most quickly solve this problem, sort by the “$ change” field to get the reduced-price items aligned together so that you can quickly determine which types of cleaners make up that group of six. c. Ultra-Shine brand bathroom cleaners experienced greater total unit sales growth from 2009 to 2010 than did deluxe brand bathroom cleaners. Explanation: This question may appear to require you to perform some calculations, but it can safely be inferred from the data that Ultra Shine had a significantly greater increase in unit sales. Deluxe’s Lemon Powder cleaner experienced a substantial (16.7%) loss, and its other two cleaners each had lower percentage unit sales changes than did the top two Ultra Shine cleaners, with the Ultra Shine cleaners each having a higher total volume than the highest Deluxe cleaner. With the third Ultra Shine cleaner also experiencing a percentage increase, it should be relatively clear that the Ultra Shine cleaners had a substantially higher unit sales increase than did the cleaners made by Deluxe. d. No orange-scented bathroom cleaner sold more units in 2009 than in 2010. Explanation: Each of the six Orange sprays experienced a positive % change in unit sales. To most efficiently solve a problem like this, sort by the fragrance type to align all six like fragrances together, then check each for a positive or negative % change in unit sales. The graph at the left is a scatter plot with 35 points, each representing the population of a city and the number of auto thefts in that city, per person, per year. All 35 measurements were made in the year 2010, counting the number of auto thefts during the year and the number of residents in each city as of January 1, 2010. The dashed line runs through points (0,0) and (35,1200). Choose the correct one from the each of the following statements based on the information given by the graph. Explanation: The number of cities that had at least 20 auto thefts per 1,000 is closest to 33% of the total cities measured. The given information notes that there are 35 cities plotted. Counting the data points to the right of the 20-thefts-per-1000-people line, you’ll find that there are 12 such cities. To quickly estimate the percentage, note that 12/36 would be exactly 1/3, or 33%, and 33% is the only answer choice that falls anywhere near the anticipated just-above-1/3 figure, so it must be correct in this “is closest to which figure” question. b. Every city with a population of no more than 600,000 had no more than _______ auto thefts per 1,000 people. Explanation: Every city with a population of no more than 600,000 had no more than 30 auto thefts per 1,000 people. Looking below the 600,000 population line on the graph, you’ll find that the highest thefts-per-thousand data point is between the 25 and 30 gridlines, meaning that every city in that under 600,000 group fell below the 30 thefts-per-thousand mark. c. There is a_______ relationship between a city’s population and its number of auto thefts per 1,000 people. 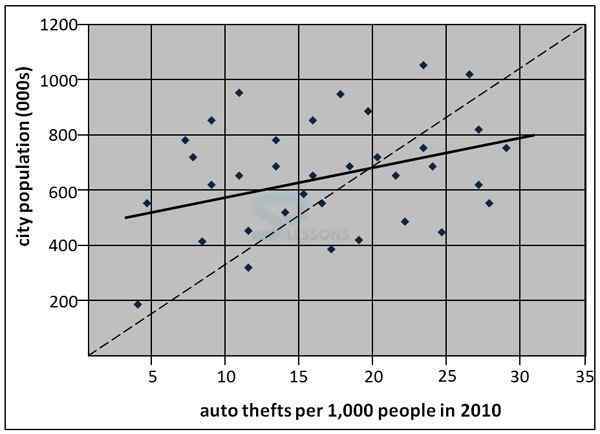 Explanation: There is a positive relationship between a city’s population and its number of auto thefts per 1,000 people. Viewing the regression line, you can note that it slopes upward and to the right – a positive slope. That slope indicates a positive relationship between population and average thefts: as the population increases, so does the rate. d. If a city had no more than 20 auto thefts per 1,000 people, it had a population of no more than _______ people. If a city had no more than 20 auto thefts per 1,000 people, it had a population of no more than 1,000,000 people. With the 20 thefts per 1,000 gridline as the right-hand border for your search, you can see that the highest data point to the left of that line is just below 1,000,000.
e. The dashed line has a slope that is _______ the slope of the regression line. The dashed line has a slope that is greater than the slope of the regression line. The dashed line starts below the regression line and ends above it, proving its steeper (and therefore greater) slope. f. According to this chart, a city with more than 10 auto thefts per 1,000 people is _______ to have a population of at least 600,000 people. According to this chart, a city with more than 10 auto thefts per 1,000 people is more likely to have a population of at least 600,000 people. Looking the to the right of the 10 thefts-per-thousand line, you can see that more data points exist above the 600,000 line than below it. Graph represents the results of a survey taken by focus groups each shown a different version of an upcoming commercial for a sports car. Each version had a different amount of content showing the car in fast-driving scenes. 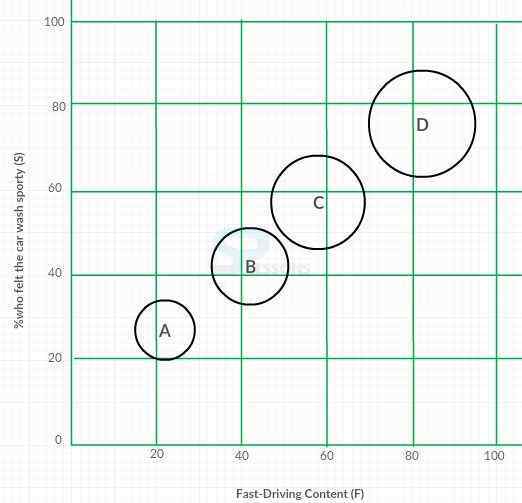 The position of the circles on the left indicate how much fast-driving content (F) was in the version of the commercial show and the % of viewers who found the car to be ‘sporty’ (S). The relative size of the circles indicates how likely the members of the group were to purchase the car (L). The bigger the circle, the more likely they were to purchase. a. If the relationship between L and S were inversed, then the greatest effect on the graph would be to the _______ of the circles. If the relationship between L and S were inversed, then the greatest effect on the graph would be to the size of the circles. b. If the relationship between L and S were inversed, then the largest circle would be _______. If the relationship between L and S were inversed, then the largest circle would be Circle A.
c. If the relationship between L and S were inversed, then were would be a _______ correlation between F and L.
If the relationship between L and S were inversed, then were would be a Negative correlation between F and L.
d. If the relationship between L and S were inversed, then were would be a _______ correlation between S and L.
If the relationship between L and S were inversed, then were would be a Negative correlation between S and L.
e. If the relationship between L and S were inversed, then were would be a_______ correlation between F and S.
If the relationship between L and S were inversed, then were would be a Positive correlation between F and S.
June 7 – If current trends continue, farmed seafood will overtake ocean fishing as the world’s largest source of seafood by 2025. Aggressive overfishing of the world’s oceans and the inability of world governments to agree on fishing limits mean that farming will become critical to the industry’s ability to meet worldwide seafood demand. Additionally, recent concerns about mercury levels in wild-caught fish have led many consumers to prefer farmed fish, further creating increased demand for this relatively new source of seafood. July 2 – Dr. Jason Dempster, one of the world’s most outspoken critics of the seafood industry’s unwillingness to curb its output in order to protect the fish population, suggests that more than two dozen popular species may become virtually extinct in the next several decades. July 20 – Demand for tilapia, one of the world’s most popular species of fish, has grown 1000% over the last decade as people around the world have discovered it as a low-cost fish that goes well with a variety of foods. This increased demand has encouraged countless tilapia farms to open in China, and American officials have expressed concern that not all tilapia imported from China meets U.S. safety standards. Some experts in the U.S. have called for creating more stringent standards for all seafood imports, but Chinese authorities warn that this may dramatically increase the cost of seafood imported into the United States. Consider each of the following statements. Does the information in the three articles support the inference as stated? And choose yes or no. a. The world’s governments usually do not agree with one another on how to deal with matters related to fishing and seafood farming. NO. While the first article notes that the world governments have been unable to agree on fishing limits that does not necessarily mean that such disagreements are usually the case. Because this current situation could potentially be a unique occurrence, the statement in question is not necessarily true, and therefore not a valid conclusion just based on the information provided. b. An increase in worldwide demand for tilapia has driven the world’s ocean fish population to dangerously low levels. NO. Article 3 discusses the large increase in demand for tilapia, but it does not indicate whether the ocean tilapia population has been threatened; in fact, the article only mentions farmed tilapia as a consumer product, so we cannot conclude anything about the ocean population. c. Dr. Dempster supports an increase in fish farming. NO. In article 2 Dr. Dempster is quoted as opposing the current fishing output, in order to “to protect the fish population”. This does not necessarily mean that he favors farming, however; his comments are specific to fishing and not to farming, so we cannot make any inferences as to his opinions on farming. d. Chinese tilapia farms have led some U.S. consumers to worry about the levels of mercury in their seafood. NO. Mercury levels are only mentioned (in article 1) as a concern relevant to wild-caught fish, not farmed fish. While article 3 does mention that American officials are concerned over safety standards with regard to China’s fish farms, the article does not indicate whether mercury is one of those safety concerns. 10:15 AM – Good news! We have received an offer on your home. The offer is for $300,000. While I know this is quite a bit lower than your asking price, it is common for buyers to make an aggressively low bid to try to bring down the seller’s price. Based on my experience, I expect that you can counter at a price of $345,000, and still end up agreeing on a price that is no lower than 10% below your asking price. Just let me know what you would like to do! 10:52 AM – We are glad to hear that someone has made an offer on our home! You are right, though. Their offer is very low compared to our asking price. While we understand that is the nature of negotiation, we are reluctant to give so much ground that we end up at a price that’s too low for us. After giving it some thought, we think that making a counter offer at $350,000 makes sense. That gives us room to negotiate more if the buyer wants to make another counter offer. Also, there are other concessions we would be willing to make besides price, if you think that might help us reach a deal. Please communicate our counter offer to the buyer, and let us know how it goes. 12:28 PM – I talked to the buyers’ agent, and it sounds as though they are willing to negotiate further on price, although the buyers have said that $350,000 is “a lot more’ than they can afford. I also mentioned your willingness to negotiate on items other than price, and they have expressed that making this sale happen no later than mid-August appeals to them, they can get settled before the new school year starts for their children. I expect that, if you offer them a price of $330,000 and agree to make the deal happen by early August, they will agree to a deal. Please let me know what you would like to do. a. The home sellers’ asking price for their home is at least $380,000. No. While it is true that $345,000 is 10% lower than approximately $383,000, it is unknown whether the “end up agreeing upon” price that the real estate agent suggests will happen is going to be that $345,000. It is more likely, from the rest of the emails that the $345,000 counteroffer will settle at a price at least substantially lower than that, making the final price equal to more than 10% less than $380,000. Accordingly, we cannot determine whether the asking price is greater than or less than $380,000. b. For the buyers, the ability to complete the purchase before mid-August is more important than the final price of the home. No. While the third email suggests that a mid-August closing date is important to the buyers, it does not necessarily indicate that such a closing date is more important than price. In fact, that very same email includes a firm rebuke of the $350,000 price point, suggesting that the final price of the home is a primary concern of the buyers. c. It is possible for the buyers and sellers to make a deal in which neither side needs to change its opening offer by more than 15%. Yes. The buyers have initially offered $300,000, so a 15% compromise for them would be $345,000. And the sellers’ agent has noted that, at $345,000, the sellers would receive a price that at maximum would reflect a 10% reduction from their opening price. This puts the maximum offer price at $383,000, a price for which 15% off would be less than $326,000. Accordingly, any price between $326,000 and $345,000 would allow both buyer and seller to achieve a price within 15% of their initial offers. Strategically, note that, as $345,000 represents at worst 10% off for the sellers and also represents the full 15% compromise for the buyers, you can answer this without performing any further calculations. A 10% compromise by the sellers and a 15% compromise by the buyers satisfies the statement in this question, so we know that the possibility is true. d. The sellers’ real estate agent is more likely to accept a lower final price of the home than are the sellers themselves. No. While the sellers’ real estate agent seems more willing to drop prices in negotiation, it is not necessarily true that he will accept a lower price in the end. Email #2 mentions that the sellers are willing to counteroffer at $350,000 in part because that higher price gives them “room to negotiate” underneath, so we do know that the sellers are willing to accept a price lower than $350,000. And the real estate agent explains in Email #3 that he feels that a settling price of $330,000 is possible. Because we do not know whether this price is considered too low by the sellers, we cannot determine whether either party’s intent is to sell for lower than the other is willing to accept, and this statement is not necessarily supported by the given information. Marisa is considering improving her rectangular bathroom. She will either install new floor tiles, paint the walls or install new wallpaper. Her bathroom’s 4 walls measure 10 ft high and 8 feet long. Assess the following statements as either True or false based on the information provided. a. The cost of installing Trinoleum Tiles in Marisa’s bathroom is $75.i) Trueii) FalseAnswer: iiExplanation:False. The length of each wall is 8 feet, meaning that the square footage of the floor is 8×8 or 64 square feet. Thus, she would need to purchase 8 packs of Trinoleum Tiles, costing $80 before the $10 rebate, so $70 total.b. The pre-rebate cost of 2 coats of Magic Color Paint on the walls of Marisa’s bathroom is $500.i) Trueii) FalseAnswer: iExplanation:True. Each wall requires 80 square feet of paint (8×10 dimensions per wall), so with four walls she will require 320 square feet of paint total. For two coats, then, she will require 640 square feet. At 32 square feet per can, then she will require 20 cans. 20 cans * $25/can = $500 before the $15 rebate.c. Marisa can cover her walls with Cloud Wallpaper for less than $100.i) Trueii) FalseAnswer: iExplanation:True. As discussed in the solution above, she will require 320 square feet of wall covering. Each pack of Cloud Wallpaper provides 80 square feet, so she will require 4 packs at $32 each. Therefore, she will spend $128 before the $35 rebate. Even without doing the pen-and-paper math to arrive at the after-rebate cost of $93, you should quickly be able to note that $128 less a $35 rebate will be less than $100, so the statement is true.d. The cost of covering the walls with Rainbow wallpaper is greater than the cost of installing Lavertine Tiles.i) Trueii) FalseAnswer: iiExplanation:False. Before the rebate, the costs are the same. To cover her floor, she needs to cover 64 square feet (8 feet x 8 feet), so she will require 4 packs of Lavartine tiles at $15/each for a cost of $60. To cover her walls, she will need a total of 320 square feet (4 walls * 8×10 feet per wall), and will therefore require two packs of Rainbow Wallpaper at $30/pack. The pre-rebate cost is thus $60, as well. Only after the $20 rebate on wallpaper and $10 rebate on tile does the cost difference become realized.e. If she chooses, Marisa can both wallpaper and re-tile her entire bathroom less expensively than she can paint it.i) Trueii) FalseAnswer: iExplanation:True. Wall coverings will require her to purchase 320 square feet’s worth, which requires 10 cans of paint at $25/can. That $250 figure is much higher than wallpapering ($60 pre-rebate with Rainbow, the cheaper option) or tiling ($60 pre-rebate with Lavartine, the cheaper option). And because the paint rebate is only $15, one need not do the math to recognize that paint is by far the most expensive option and will not come close to the potential for tile/wallpaper together. Manufacturers will often provide after-purchase rebates to consumers who purchase their product from a retailer as an incentive for consumers to buy their products over competitors products. House Depot, a large home improvement retailer, has several manufacturer rebate promotions on popular home improvement products during the month of July. In order to qualify for the rebates, one must purchase at least the minimum dollar amount for each product according to the table below. a. The cost of installing Trinoleum Tiles in Marisa’s bathroom is $75. False. The length of each wall is 8 feet, meaning that the square footage of the floor is 8×8 or 64 square feet. Thus, she would need to purchase 8 packs of Trinoleum Tiles, costing $80 before the $10 rebate, so $70 total. b. The pre-rebate cost of 2 coats of Magic Color Paint on the walls of Marisa’s bathroom is $500. True. Each wall requires 80 square feet of paint (8×10 dimensions per wall), so with four walls she will require 320 square feet of paint total. For two coats, then, she will require 640 square feet. At 32 square feet per can, then she will require 20 cans. 20 cans * $25/can = $500 before the $15 rebate. c. Marisa can cover her walls with Cloud Wallpaper for less than $100. True. As discussed in the solution above, she will require 320 square feet of wall covering. Each pack of Cloud Wallpaper provides 80 square feet, so she will require 4 packs at $32 each. Therefore, she will spend $128 before the $35 rebate. Even without doing the pen-and-paper math to arrive at the after-rebate cost of $93, you should quickly be able to note that $128 less a $35 rebate will be less than $100, so the statement is true. d. The cost of covering the walls with Rainbow wallpaper is greater than the cost of installing Lavertine Tiles. False. Before the rebate, the costs are the same. To cover her floor, she needs to cover 64 square feet (8 feet x 8 feet), so she will require 4 packs of Lavartine tiles at $15/each for a cost of $60. To cover her walls, she will need a total of 320 square feet (4 walls * 8×10 feet per wall), and will therefore require two packs of Rainbow Wallpaper at $30/pack. The pre-rebate cost is thus $60, as well. Only after the $20 rebate on wallpaper and $10 rebate on tile does the cost difference become realized. e. If she chooses, Marisa can both wallpaper and re-tile her entire bathroom less expensively than she can paint it. True. Wall coverings will require her to purchase 320 square feet’s worth, which requires 10 cans of paint at $25/can. That $250 figure is much higher than wallpapering ($60 pre-rebate with Rainbow, the cheaper option) or tiling ($60 pre-rebate with Lavartine, the cheaper option). And because the paint rebate is only $15, one need not do the math to recognize that paint is by far the most expensive option and will not come close to the potential for tile/wallpaper together. Work crews Alpha and Zeta are repaving a section of freeway in Los Angeles. Work crew Alpha started its work one week (40 working hours) earlier than work crew Zeta, and started on the north end of the freeway, working its way south at a rate of 12 meters per hour since starting the job. Now, work crew Zeta has started at the south end, working its way north at a rate of 10 meters per hour. The section of freeway that needs to be repaved is 1.5 kilometers long, including the section that has already been paved. Given that each crew will not necessarily work the same number of hours, which of the following answer choices represents an hourly workload for each crew that will finish the project? Please make only one selection in each column. By plugging in values from one column, you will be able to compare the result with values from the second column, and you will find that A = 60, Z = 30 gives you the correct answer. Two companies are competing with one another for a contract to provide work uniforms to a customer, which is a large global manufacturing business. Company A sells its uniforms for $25 per uniform, and Company B’s price is $30 per uniform. Both companies sell their uniforms in lots of 5,000 each. The customer has considered ordering some uniforms from both companies, in order to test them out before committing to one company on an ongoing basis. The company wants to spend exactly $1,000,000 on the test purchase. In the table below, identify the number of uniforms that the customer should buy from Company A and from Company B so that the customer spends exactly $1,000,000. Make only one selection in each column. We also know that each must be purchased in bundles of 5,000 shirts (that is, A and B must both be multiples of 5,000), but the answer choices already take this into account for us. By testing values from one column, you will find that the correct answer is A = 10,000, B = 25,000. Framing the equation in this manner should help you quickly eliminate some of the larger values from Column A, encouraging you to spend your time checking the smaller values instead – and finding the correct answer in the process. Joseph: Health insurance premiums are growing at an alarming rate. This is, in part, because many hospitals and clinics bill for unnecessary diagnostics and tests that inflate the subsequent amount that insurers pay out to them. These expenses are then passed on to consumers in the form of increased insurance premiums. Therefore, reducing the number of unnecessary tests performed by health care providers will be effective in controlling growing health insurance premiums. Ronald: Often times, the unnecessary diagnostics that you speak of are the result of decisions made by doctors on behalf of their patients. Doctors will often choose the diagnostics that will allow them to bill insurers for more money, but may not be necessarily benefit the patient in a meaningful way or influence the course of treatment chosen. As a result, in order to succeed in reducing the number of unnecessary tests, we should allow the patient to decide which course of diagnostics they would like to undergo. In the table below, identify the assumptions upon which each person’s argument depends. Make only one selection in each column, one for Joseph and one for Ronald. Doctors are generally able to determine, with great reliability, which diagnostic procedures and tests would yield the most effective results. Tests and diagnostic procedures do not make up an insignificant portion of the bills that are sent to insurers. Insurance companies in other industries such as auto and home, have been able to reduce costs by reducing the number of unnecessary repairs and replacements on claims for automobiles and homes. Patients are not just as likely as doctors to choose the most expensive diagnostics and tests. Health insurance premiums have increased twice as fast in the past 5 years than they have over an average of the past 25 years. * Tests and diagnostic procedures do not make up an insignificant portion of the bills that are sent to insurers. * Patients are not just as likely as doctors to choose the most expensive diagnostics and tests. Joseph argues that growing health insurance premiums can be controlled by reducing the number of unnecessary tests performed by doctors. He says this because many tests that are performed, and then billed to insurance providers, are unnecessary. But note the assumption — while this practice may relate to **some** excess expenditure, the argument assumes that it’s enough excess spending that, if it were cut, the health care industry could save quite a bit. Accordingly, the second assumption, that “tests and diagnostic procedures DO NOT make up an insignificant portion of the bills to insurers”, is required. Without it — if we could then say (via the Assumption Negation Technique) that these tests DO represent an insignificant portion of the bill, then their presence or absence does not matter. Accordingly, Joseph’s argument requires that fact. Ronald argues that, if patients are allowed to make decisions instead of doctors doing so, the number of unnecessary tests will decline. He believes this because of the stated fact that doctors are purposely selecting expensive tests to perform. However, his conclusion is a two-part conclusion — it’s not just that “doctors shouldn’t be making these decisions”, it’s that “patients should, instead”. And so his argument assumes that patients will make better decisions. That corresponds with the fourth choice that “patients are NOT just as likely as doctors to choose the most expensive diagnostics and tests”. If that assumption is not true — if patients ARE just as likely to choose the expensive tests, then Ronald’s proposal does not reach his stated aim, to succeed in reducing the number of tests. Client: Our newest line of mini-computer, the JS-780, is not gaining traction with our customers. Although it is a better product than our main competitor’s SS-600 and has a faster processor, and a more sophisticated graphics card, the product has not sold as many units as the SS-600. Our JS-780 is priced higher than the SS-600. We would like to figure out how to convince potential customers to pay more for our product as opposed to purchasing our competitor’s product. Marketing Consultant: Our research shows that many people do not understand the benefits of having a mini-computer with a faster processor and more sophisticated graphic card. I recommend that you run a television commercial featuring a well-known celebrity who will educate the public about the benefits of having such features in a mini-computer. People are generally trusting of well-known celebrities and find commercials featuring those celebrities persuasive. Therefore I recommend that you undertake such a television commercials. In for the Marketing Consultant’s suggestion to have the client’s desired effect, it depends upon a cause and effect relationship. Choose the cause and subsequent effect in the columns below upon which the Marketing Consultant’s suggestion depends. Choose only one for each column. The public will become more trusting of well-known celebrities. The public will find the commercial campaign to be persuasive. The JS-780 will be featured in the commercial. The public will place a greater value on a mini-computer with a faster processor and more sophisticated graphics card. The makers of the SS-600 will respond with their own commercial featuring a well-known celebrity. The public will purchase mini-computers in greater quantities than they have in the past. * The public will find the commercial campaign to be persuasive. * The public will place a greater value on a mini-computer with a faster processor and more sophisticated graphics card. Note here that the goal of the marketing consultant is to find a way to convince customers to spend more money on a faster processor and more sophisticated graphics card — or, put another way, to ascribe more value to these features. Accordingly, the campaign needs to persuade people that these features have increased value. Therefore, the cause-effect relationship should start with a convincing, compelling campaign, and the effect should be that people do, in fact, see that value as a result. That makes the cause the second item (“the public will find the commercial campaign to be persuasive”) and the effect the fourth (“the public will place a greater value on…” these features). The first choice is out of scope, as the factual, given information already states that the public finds these celebrities trustworthy, so no increase there is necessary. The third choice is also unnecessary — the commercials’ goal is to ascribe value to the features, and not necessarily that particular machine. The fifth choice is far out of scope (nowhere in the goals would there be any desire for the competition to perform their own commercials). And the sixth, while tempting, is also out of scope. The sixth choice pertains to all mini-computers, and this campaign is specific to the properties of the JS-780. Selling more JS-780s is the ultimate goal, but the particular steps involve marketing the particular attributes, not growing the entire market segment.